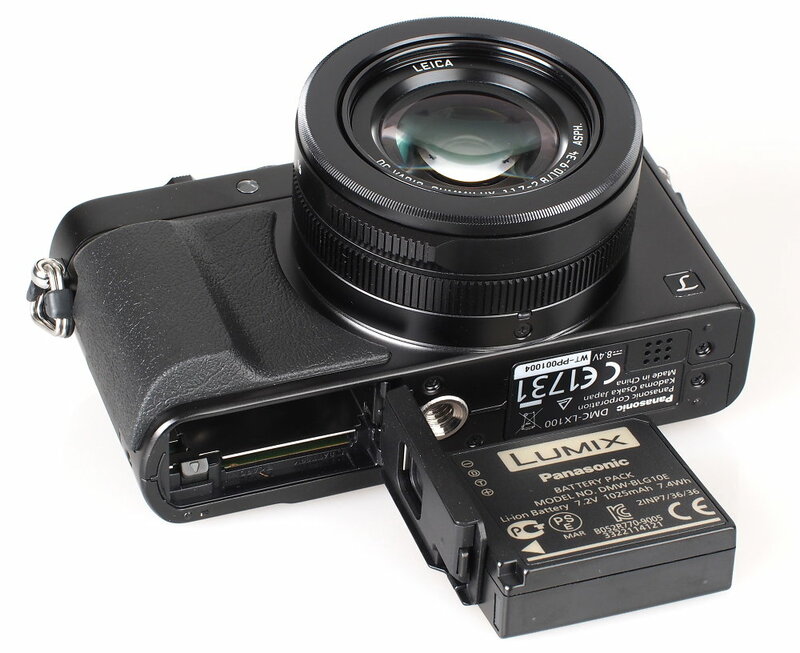 I am looking for a piece that I can attach to the bottom of my Panasonic LX100, which has a tripod hole that is very close to the door of the battery compartment. I am looking for something that I can attach to the bottom of my camera and will effectively "shift" the tripod hold a couple of inches to the side. I undertand this will be a relatively thick piece and will add bulk to the camera, but I don't mind. The gadget you're looking for is called an offset plate, but there's the legendary bad news and good news. The bad news is that I've never seen one small enough that it wouldn't interfere with the battery door on your camera. Most of them are designed for SLRs and other cameras with lots of room on the bottom. The good news is that the cost of material and labor for a metal shop to fabricate one to fit your camera wouldn't be much. It would just be a small piece of bar aluminum with two threaded holes tapped in it, pretty much what's in your drawing. 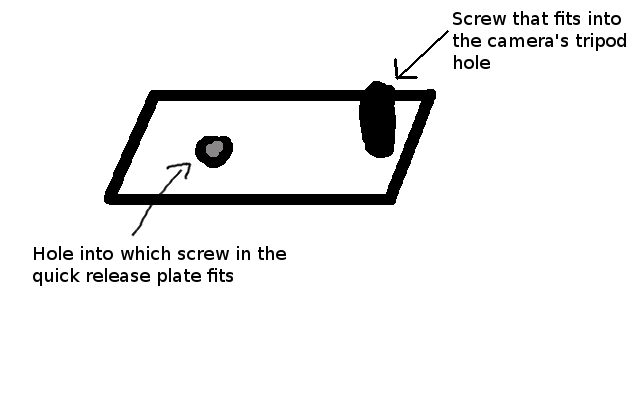 One hole is as close to the edge of the plate as possible and passes a short screw into the camera; the other is as far off as you want and receives the tripod screw. The thread size for the holes and screw is 1/4"-20; the shop will know what to do with it. The screw you'd need should be available at any hardware store and should have threads long enough to pass through the plate plus an additional 1/4" to catch the threads in your camera. Edit: I looked for some additional pictures of the bottom of your camera, and a few seem to imply that the door has to swing further than perpendicular to the base to get the battery out. 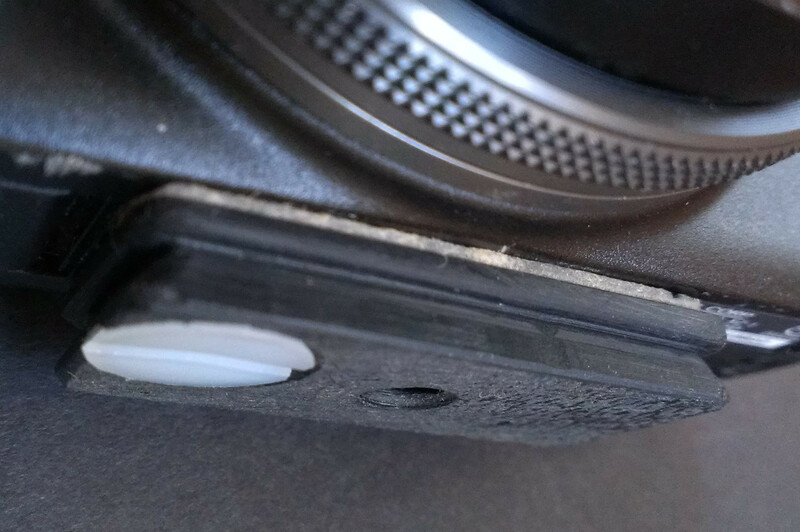 If that's the case, the proximity of the tripod socket to the hinge may make it impossible to build something that will work because the plate will need to be at least 1/4" thick. I gave up looking for a plate, but I found a monitor bracket that works with a little modification. Smallrig® Cool Cheese Bar with 1/4" & 3/8" Screw Holes for Lilliput - $11 Amazon. I sawed off the end, about 3/8" and ground flat. Drilled out the closest 1/4" hole to edge and bought steel bolt @ Lowe's. $13 total. Also snagged a L Bracket Holder Mount 2 Hot Shoe for DSLR Camcorder Mic Microphone Video Light off Ebay for $8. Can mount recorder and boom mic for lightweight rig. Plus put a grip handle underneath too, had a cheap one from somewhere. Pretty good and don't have to worry about hitting focus ring. Instead of looking for a plate with an offset hole, it may be easier to find a suitable tripod quick release plate. These use a clamp which screws onto the top of your tripod, and a plate screwed to to the bottom of the camera. Then the plate just slides into the clamp, and locks in place. Hejnar Photo point and shoot plates - different sizes, with 3 slots for screws, so you have more ways of mounting it. Or an even smaller quick release system is the FLM Power Release. It uses its own style of clamps, with a tiny plate that screws onto the camera. See FLM PRP-45 QR plate. Not the answer you're looking for? Browse other questions tagged tripod tripod-heads tripod-socket or ask your own question. What are the different Canon tripod mount ring types for? Which Canon lenses use a B size tripod mount? What kind of tripod/head/rail system can I use for precise vertical-only movement? Do they make a single-leg stabilizer, similar to a tripod but with only one leg? What is the purpose of the second bump on the plate of this tripod?